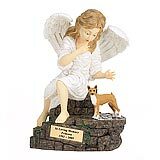 "The memorial arrived about a week ago. It is very beautiful. I have already found a place in the garden and set it there. Your service has been excellent. Thank you for your help and expressions of sympathy. Both are greatly appreciated." 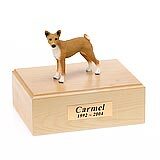 All available Basenji dog urns and memorials will be displayed with the figurine on the Basenji urn you select and in the appropriate size.